We all remember Sonic the Hedgehog. 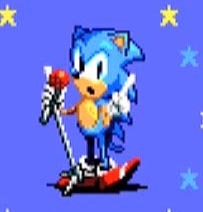 The super-fast, spiky-blue hedgehog has been sitting atop of the SEGA throne as mascot ever since he kicked Alex Kidd off it way back in 1991. Sonic was the “killer app” for the 16-bit Genesis/Mega Drive system back in the early ’90s. His cocky attitude, tremendous speed and colourful game world went down a storm with gamers. Sonic single handedly helped SEGA overtake the mighty Nintendo in terms of console sales for a good period of time. He was even featured as a huge balloon in a 1993 Thanksgiving Day parade and starred in official music videos! Looking back, it’s clear that everyone wanted a piece of SEGA’s newest star. As with every new generation of consoles, the 16-bit systems of yesteryear were not cheap at launch. SEGA’s 8-bit console, the Master System, already had a rich install base, and it was no-brainier to bring Sonic to the many fans who were still yet to jump ship. SEGA set to work assembling a small group of people who’s sole purpose was to make this happen. Replicating Sonic’s unprecedented speed and colourful graphics on 8-bit hardware was not to be an easy task. Creating the sense of speed found in the 16-bit versions with a far slower processor speed and to produce graphics as pretty with such a limited colour palette was next to impossible. Instead, the development team chose to focus more on the platforming aspect, with unique and varied locations created especially for the Master System. Let’s take a look back at the three mainline Sonic titles created for the Master System and appreciate how creative the very small development teams had to be to bring Sonic into the world of 8-bit. The first Sonic game for the SEGA Genesis was released in June 1991. Master System owners had to wait an excruciating four months until they could finally get to experience what every kid in the playground always had on their minds. Sonic the Hedgehog was released in October of 1991 and was worth the wait. Everything Sonic had become famous for was here: abstract environments, colourful graphics and his trademark speed. All, of course, within the limitations of the Master System hardware. Don’t you wave that finger at me, young man. As mentioned previously, the gameplay in Sonic the Hedgehog on Master System is geared more towards platforming than speed. This certainly isn’t a bad thing though, as the tight controls and simple, yet unique platform puzzles make it a very enjoyable experience. Rather than star posts, checkpoints are instead represented by TV monitors with a downwards pointing arrow on the front. Enemy sprites, although familiar, are much smaller in size. This was most likely due to the limited memory and colour palette of the Master System. Don’t be mislead though, the enemies are still deadly, and one hit will send Sonic flying backwards, dropping all of his golden power rings. Bonus levels can still be accessed by finishing each stage with 50 rings or more, but they now no longer house Chaos Emeralds. Instead, six of Sonic’s precious trinkets are hidden throughout all of the Zones included in the game. It sounds simple, as they’re literally just placed on the ground for players to grab, but you’ll have to put your exploration and platforming skills to good use if you’re to find them all. Green Hill Zone in all its 8-bit glory! 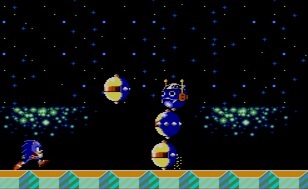 While the Master System version of Sonic does share certain stages with its 16-bit cousin (such as Green Hill Zone, Labyrinth Zone and Scrap Brain Zone), several new environments were created. These catered to the older hardware, but also gave a reason for gamers to pick up both titles and allowed the developers some creative freedom. 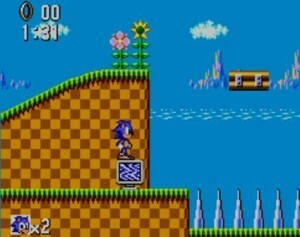 Bridge Zone, a level with similar appearance to Green Hill, replaces Marble Zone. Sonic must navigate over rushing water, making use of springs and see-saws to chase after his nemesis, Dr. Robotnik. Jungle Zone comes afterwards, with Sonic traversing across deadly rivers and sliding down vines as he races through this colourful utopia. This zone has a particularly strong focus on platforming, with the second act seeing our hero traverse up a large waterfall as the screen scrolls vertically. Taking a leaf out of Super Mario Bros 3, Sky Base Zone acts as the lead up to the final boss and sees Sonic infiltrating Dr. Robotnik’s airship. These three levels alone make playing the 8-bit version of Sonic the Hedgehog worthwhile, even if you have played the 16-bit version countless times before. In addition to all of this, the music in the game successfully captures the catchiness of the Genesis tunes. The music was composed by Yuzo Koshiro, a Japanese composer / audio programmer well known for his work on Y’s I & II, Streets of Rage, The Legend of Oasis, Shenmue and more recently, Kid Icarus: Uprising. Although not as complex, the tracks included in the 8-bit version are very faithful to their 16-bit counterparts. The levels unique to this version also include memorable tunes, all of which have received many fan remixes and Genesis style remakes years after their original composition. He is a little wonderman! A Game Gear version of this title was also released. Due to the change of screen resolution, the sprites look a little different and Sonic appears to have a squashed nose. You can pick up the Game Gear version on the Nintendo 3DS eShop for $4.99. The development team consisted of only seven people, including graphic design work from Ayano Koshiro (Y’s, Lunar, Beyond Oasis) and programming by Shinobu Hayashi. In the Xbox 360 and PlayStation 3 version of the 2008 title Sonic Unleashed, a melody very reminiscent of the credits theme from Sonic the Hedgehog can be heard during the Mazuri stage. This was particularly audible in an early trailer for the game. After the roaring success of the first title, Yuji Naka and company set to work on a sequel to SEGA’s 16-bit hit. With both Sonic the Hedgehog 2 and Sonic CD deep in development, SEGA’s hands were tied and without the aid of a third party studio, it was looking very unlikely Sonic would be returning to 8-bit systems. That’s where Aspect Co. came in. Founded in March 1991, Aspect is a Japanese studio which once specialised in creating content for the SEGA Master System and Game Gear. It was to them the torch was passed as they set to work on bringing the highly anticipated sequel, Sonic the Hedgehog 2, to 8-bit platforms. It’s Tails, too! Shame he only features on the title cards and not as a playable character. Released one month before it’s 16-bit cousin and a year after the first title, Sonic the Hedgehog 2 hit shelves on Oct. 16, 1992. The Game Gear version arrived shortly after, and curiously enough, it was exclusive to SEGA’s new handheld system in both North America and Japan. The Master System version was however released in both Europe and Brazil and featured all new levels, graphics and game mechanics. Everything familiar to fans of the first title was here: golden power rings, TV monitors containing power ups and six hidden chaos emeralds. Rather than being included as a playable character, Tails is in need of Sonic’s rescue. 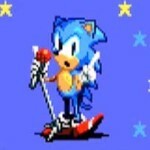 At the start of the game, a very short opening sequence shows Sonic in the pursuit of series antagonist Dr. Robotnik as he flees with a captured Tails. Despite his captivity, lively little images of Sonic and Tails in can be seen on the title card for each stage, which adds a lot of character to each stage. 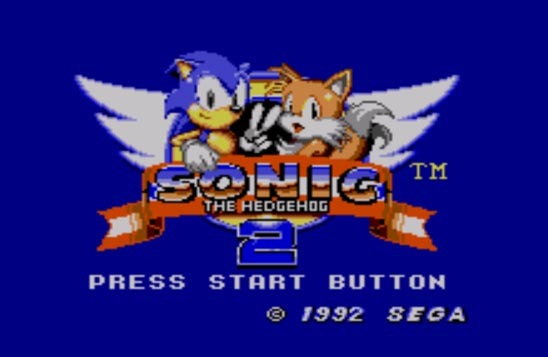 Unlike the first game, Sonic the Hedgehog 2 was completely independent from the Sonic Team developed 16-bit release. With unique zones and features, Aspect made good use of the Master System hardware and took the art direction and level theming of the game in an interesting new direction. Typically, Sonic titles start in a bright and colourful location with players whizzing through a grass-land environment. These stages are very pretty, acting as a eye catch to draw people in and gently ease them into gameplay of Sonic. With Sonic the Hedgehog 2 however, Aspect took a different approach. Players begin in the very bleak looking Underground Zone, rolling down dangerous tunnels and leaping across scorching hot lava. Right from the get go, new mechanics are introduced with players riding tiny mine carts through the underground labyrinth, dodging spike traps and eventually reaching the sign post at the end of the level. It’s certainly very different as to what you’d expect from the opening level of a mainline Sonic title, but change isn’t always necessarily a bad thing. It’s challenging from the very beginning and that’s certainly something fans of the first title will appreciate. There’s a good chance if you played this as a kid, you never even saw past this first boss fight. Timing is key! Sonic the Hedgehog 2 creates a new sense of danger by making use of deadly traps found throughout the levels. You will find more bottomless pits and spike traps scattered throughout zones than you will buzzbombers and crabmeats. This title is not for the impatient gamer as it presents far more of a challenge than either of the previous titles in the series did. Later levels can feel like a maze with Sonic whizzing around in circles, ending up with the player standing right back where they started. Level bosses are also very difficult as no golden power rings are present during the third act. This means one hit and you’re down for the count. Add to this some very tricky boss battles with a strong emphasis on dodging/timing, and it can be a very frustrating experience. This is especially true for the Game Gear version, as the smaller resolution made it much trickier to see oncoming obstacles. 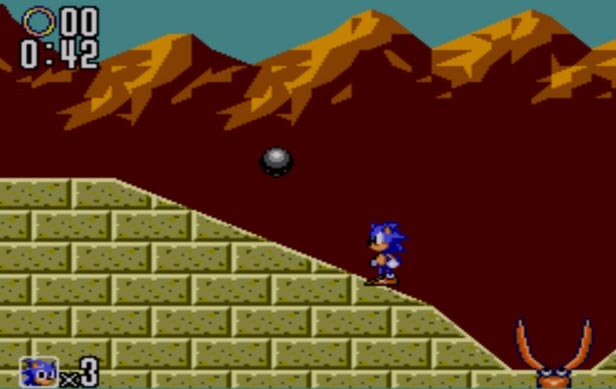 Less screen space to work with means less chance for error and boss battles, such as the first one (which sees Sonic standing atop a steep slope dodging random bouncy steel balls), made it very difficult to progress. Aqua Lake is certainly the most unique looking stage in the game. Sonic is able to bounce across the top of the water, too! 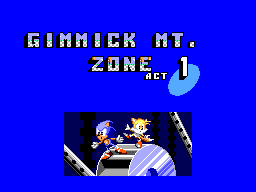 Despite beginning with Underground Zone, Sonic the Hedgehog 2 does include a variation of Green Hill Zone. The fourth zone, Green Hills, is very colourful and sees Sonic speeding up and down grassy hills. You may recognise the music, as the level includes an 8-bit remix of the Toot Toot Sonic Warrior theme tune heard in the European and Japanese versions of Sonic CD. Sonic The Hedgehog 2 sees the return of Sonic’s nemesis, Dr Robotnik, but it also includes the first appearance of Silver Sonic. Later appearing in Sonic 2 for the Genesis and as a cameo role in Sonic Adventure, Silver Sonic acts as the boss for the maze-like Scrambled Egg Zone. He fights in a very similar manner to that of his 16-bit cousin, but he’s much faster and is certainly no push over. If you’re low on patience, you might find this encounter to be the most difficult found throughout the game. Shortly after the release of Sonic the Hedgehog 2, Aspect went back to the drawing board to create one final 8-bit outing for our hero on the SEGA Master System. In October 1993, Sonic Chaos was released on the Master System in Europe and just like with Sonic the Hedgehog 2, one month later it exclusively hit Game Gear systems in North America and Japan. 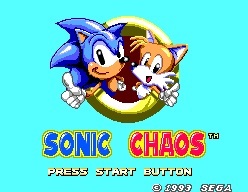 Sonic Chaos is a unique adventure designed exclusively for 8-bit systems. Aspect had total free reign on where to take this title and funny enough, it felt more traditional than Sonic the Hedgehog 2 did. This time, players can choose either Sonic or Tails as their playable character as they race through six different zones; Turquoise Hill, Gigalopolis, Sleeping Egg, Mecha Green Hill, Aqua Plant and Electric Egg. They’re back, and this time both playable! Despite the older hardware, Sonic Chaos had a greater focus on speed than the previous two 8-bit titles. Sonic and Tails run through loop de loops, corkscrews and make use of two new powerups, the rocket and spring shoes to dash through stages. Graphics are much nicer this time around, as well, with a more stylised look and much bigger sprites for the badniks and bosses. This wasn’t without problems however, as frequent slowdown can be experienced when the screen starts to get busy. 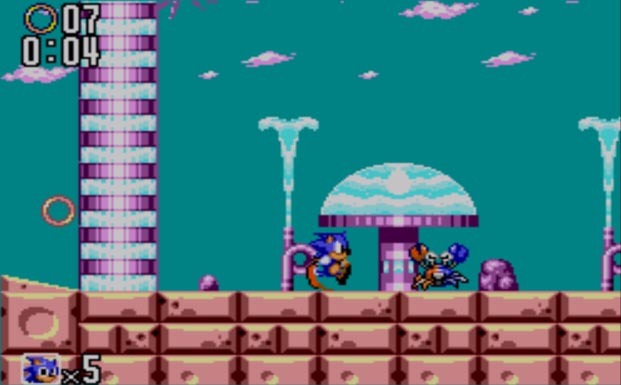 Sonic’s familiar 16-bit moves also make their 8-bit début in Sonic Chaos, with Sonic the Hedgehog 2’s spin dash and Sonic CD’s super peel out both included in the game. These special abilities help to create the sense of speed Sonic is so well known for on the Genesis and Mega Drive system, but they are also one of the biggest causes of the frequent framerate drops. We’re glad this guy didn’t show his ugly mug again any time soon! Unlike the previous two 8-bit titles, Sonic Chaos features special stages. Just like in the 16-bit titles, a Chaos Emerald is hidden in each, and there are six up for grabs. Players access the special stage by collecting 100 rings (as Sonic only), and each one has a completely different theme. Players must race the clock to collect the emerald, climbing up vertical platforms, navigating through tricky tube mazes or by simply flying through the air with rocket shoes. 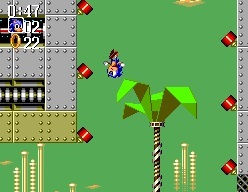 The controls in Sonic Chaos are a little slippery, which can make precision platforming, such as in the vertical climb special stage very difficult. Speaking of difficult, boss stages once again make a return with Sonic and Tails battling some of Dr Robotnik’s latest robot animal creations. Golden power rings, which were absent during the boss stages of Sonic the Hedgehog and Sonic the Hedgehog 2, are now present, but the bosses themselves can be a fair bit tougher. In particular, the boss battle found in the fantastically named Gigalopolis Zone caused me much trauma as a child, and I still find it challenging today. Due to the shape and size of the enemy, it’s very difficult to jump over him and collect lost rings, making it essential you avoid the projectiles and do not get hit during the fight. The recognisable Green Hill Zone also makes its third 8-bit appearance in Sonic Chaos, and it’s one of the best stages in the game. It’s in no way traditional, as this time around Green Hill has been taken over by Dr Robotnik and transformed into Mecha Green Hill. The visual change is very cool and some of the recognisable Green Hill features, such as the dancing flowers, towering palm trees and the spring rocks are now mechanical. The only letdown of the stage is the boss fight at the end. Sonic and Tails must defeat a mechanical sloth as it climbs up and down a palm tree. All it takes to progress is for the player to bounce on its head and remain there for the few seconds, which is very unsatisfying. Apparently, the Japanese name for this particular boss is Kamado MAX, which derives from the Japanese word kamadome (meaning do not chop down trees.) If that isn’t a hidden environmental message, I don’t know what is! One thing certainly hasn’t changed in Mecha Green Hill, and that’s the springs. Both the Master System and Game Gear versions of Sonic Chaos have slightly different music. This is most noticeable in Aqua Plant Zone, as while the majority of the tune remains the same the melody at the beginning of the song is quite different. You can compare the two for yourself here and here. Graphics are a little different too, with stages such as Mega Green Hill having different coloured backgrounds in each version. Speaking of music, the composer for this title is none other than Kojiro Mikusa. Mikusa worked on various other recognisable SEGA titles, including Tails’ Adventures, the Game Gear version of Jurassic Park and also the popular Dreamcast/Gamecube RPG, Skies of Arcadia. I think it’s safe to say all three mainline 8-bit Sonic titles are very unique and quite different from their 16-bit counterparts. Both SEGA and Aspect did a superb job in bringing the popular Sonic gameplay to the Master System while still giving a the franchise a fresh feel and providing enough unique content for owners of both system to have the desire to pick it up. From Scrap Brain to Scrambled Egg, there is a lot of fun to be had with these titles and despite not looking as pretty or running quite as smoothly as the Genesis games, it would be a huge shame if they were to go unnoticed. Fortunately for you, all three titles can be picked up on the Nintendo Wii Virtual Console and also on the Nintendo 3DS eShop for but a small asking price. I would highly recommend these titles to any fan of the blue blur and/or retro SEGA fanatics alike. Lee is a huge retro SEGA nerd and currently resides in bonnie Scotland. Starting out with a SEGA Master System, some of his favourite SEGA titles include Monster World IV, NiGHTS Into Dreams, OutRun 2, and of course, Sonic the Hedgehog. When he's not playing old SEGA games, he's probably sat watching Lupin III.